Something I left out of recent concert reviews was the topic of the audience talking during the whole performance. I'm asked to write a review of a performance by an artist, not of the people watching the performance. So that armchair sociology has to be addressed somewhere else, like this blog. Talking comes with the territory, as most shows I've been to have had that white noise. But usually that is relegated to the area right in front of the bar. People buy drinks, talk with friends, or try to make new connections. I get that. 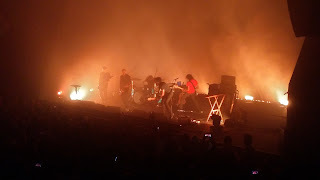 But when I watched Explosions in the Sky play at the Bomb Factory last summer, I couldn't help noticing how many people chatted away while the band put on an incredible show. Hope and I were seated upstairs in a spot where we could see the stage and the crowd quite well. As the band played one great tune after another, I kept hearing people talking down below. It was not a small group of people. It was a lot of people. And they weren't anywhere near a bar. I started to wonder, why should you pay good money to get into a venue to talk to people constantly? You paid to see this band, right? You can talk to people for hours at any bar where there is no admission, so why the need? I've heard this is a Dallas thing, but that's not true with every large show in town. The shows I've seen at the American Airlines Center did not have thousands of Chatty Cathys while Rush, Muse, or Alice Cooper played. Those people paid quite a bit of dough to see a show of this magnitude. It made a lot of sense to keep the talking to a minimum. Venues that can hold almost one thousand or a little more seem to have this problem. Tickets are not cheap, like seeing your friends play for $10 in a room that can hold 200 people. But the general admission tickets are not near the three figure mark. There's a buffer of $30-$55 in the price. And for whatever reason, that's the price where people think it's OK to treat a venue like it is a small bar. At the shows Hope and I see, we briefly talk to each other here and there about the show, but privately, talking into an ear. We're not carrying on a long conversation. We have all the time in the world to talk about the show afterwards. And not at a volume that tests the strength of our vocal cords. During the most recent show we saw together, a three-hour tribute to the music of Neil Young at the Granada Theater, I saw quite a few couples around us talking constantly. Tickets for this were $50 each. I'm talking money that could be well spent on groceries, gasoline, or records. To simply blow that money off like it's nothing does not compute with my budget-minded ways. Maybe it's a way of expressing boredom with the performance. Maybe it's a way of showing entitlement of some kind. For whatever reason, I'm not about to fall in with the crowd thinking this is OK. Seeing bands has made an indelible mark on me, and I'm not about to let a trend of short attention spans stop me from seeing what I want to see.